Click here for current list of package winners! Weekly tournaments at your favorite local establishments in Seattle and the Pacific Northwest. 15 Satellite Tournaments!!  Estimated 80+ Tournament Prize Packages to be won!! for a combined prize pool valued at over $10,000!  New in 2019: We'll be using the Fair Strike Group Knockout format in a few of the satellite events!  Variety of tournament formats: Match Play, Multi-Play, Knockout, Group Knockout, PinGolf, and Team Brawl!  Win Guarantee - See Details below! Click on tournament name for results, if available. We want everyone to go to the show, and doing what we can to help! So if you play in at least 7 of the satellite tournaments, and you don’t win a tournament prize package, then we’ll GIVE you a weekend pass to the show ($65 value), for your support and participation of the tournament series.  Additional prize package for every additional players (32 players = 4 total packages; 40 players = 5 total packages, etc.).  Plaque for winner of every tournament (excluding MNP Team Brawl).  Player has not yet won a package via this Rookie&Amateur Guarantee in a prior satellite this season.  In Match-Play, player must have at least advanced to the first playoff round.  In a 3-Strike Knockout or Group Knockout tournament, player must have survived at least through Round 6.  In PinGolf, player must at least be in top 50%.  The rule doesn't apply to the MNP Team Brawl, but due to team cap, we expect multiple players with IPR of 3 or less to win packages.  If there are no players who reach the eligibility threshold, or the top-finishing player with IPR 3 or less ranks high enough to win a regular package, the prize package will go to the next highest ranked player overall that did not yet receive a package.  Check the Monday Night Pinball / NWPAS Player Search page to determine if your IPR. Plus many raffle prizes at every event!  Every player on winning team wins a tournament package.  Additional prizes for 2nd and 3rd place with 8 teams participating.  80 total prize packages is estimated. Actual number of packages could be higher or lower, depending on total number of participants.  When a player wins a second package, it is considered a “guest/+1” of their first package. The person they give the package to must accompany them when they check-in to the expo and each tournament.  Players who have already won two packages can still play in a tournament and earn WPPR points, win raffle prizes, and win a plaque, but will be ineligible for tournament prize packages. If they qualify for a prize package, the package will go to next highest finishing position.  Rebuy in the Main Tournament is $30; players cannot use an entry won in a satellite tournament for a rebuy.  Players who earn free weekend passes through volunteering time at the show, bringing machines, or as a sponsor, can request a $65 gift certificate to be picked up and used anywhere at show, in lieu of the weekend pass.  Tournament prize packages that are not claimed at the show are forfeited.  Packages are not transferable, with exception that a winner of two packages can transfer the second one to their “guest/+1”. Below is a description of each tournament format. Note that adjustments to any format could occur up to the time of the event. In general, if there are major changes needed, they will be announced on the Facebook Event page for that tournament, as well as on this website, with as much notice as possible. This will be the same knockout format as used in many of the local weekly and monthly tournaments, with one key exception. Once all players remaining have won packages, the tournament ends. Final placement is based on number of strikes each player has, with ties for equal strikes. If there is more than one player with least number of strikes, then a ONE GAME final playoff game is made amongst those players, with final results of that game determining final position in the tournament. If there is a tie for who wins a package and who doesn't after multiple players get knocked out, it will be a ONE GAME tie breaker amongst those players. This will be a group knockout tournament in which players are arranged in groups of 4 when possible, but occasionally groups of 3, and with five or less players remaining, possibly group of 2.  A player continues to play until they get 6 (or more) strikes, at which time they are eliminated.  Winner of the game does not get a strike.  Loser of the game gets two strikes. This would be 4th in a 4-player game, 3rd in a 3-player game, or 2nd in a 2-player game.  A player who neither wins nor loses gets 1 strike. This would be both 2nd and 3rd in a 4-player game, and 2nd in a 3-player game. Once all players remaining have won packages, the tournament ends. Final placement is based on number of strikes each player has, with ties for equal strikes. The qualifying round is a traditional match play tournament.  There will be 5 rounds of 4-player games (or some 3-player games if odd number of players).  Points will be earned per game based on IFPA Scoring.  Ties will be broken as described below.  With 46 or less players (5 packages), top 8 make semi-finals, as two groups of 4 players. Top two of each group moves on to Finals. If needed, a one-game consolation final for the 5th package.  With 47 or more players, top 16 make semi-finals. Winner of each semi-final group move on to finals and win packages. 2nd in each group move to consolation finals to compete for remaining packages. In case of a 9th package being available, multi-play consolation final will be among those who finish 3rd in each group (instead of 2nd) in semi-finals, as everyone finishing 2nd will have also won packages.  Play proceeds similar to qualifying rounds, except that there are 4 players on 4 machines. Rotation to the right occurs similarly.  Points are earned for each game based on IFPA Scoring. This tournament will run similarly to the qualifying portion of the Classic PinGolf at NWPAS, with just a reduced number of Tee-Off times (72 slots), and no playoff round.  Two players tee-off at a time, but still play as one-player games. Players will be able to reserve a tee-off time starting a week before the event.  Every machine will be set to 5-ball play, and will list a target score. Reach the target score in 1 ball for a hole in one. Reach it in 2 balls, then get a score of 2 strokes, and so on. If the target score is not reached after 5 balls, then earn a stroke score of 6 to 10, depending on how close to the target score reached. The score ranges (80%, 60%, 40%, 20% of score) will be shown on a note on the backglass.  When a player reaches their target score or their game ends, they should raise their hand to call over the scorekeeper to verify and record the score.  Extra balls can be played, and counts as an extension of the current ball being played. Thus if a player earns an extra ball on ball 2, and during that ball 2 they reach the target, they get a score of 2.  When a target score is reached, the player stops playing and informs the scorekeeper of the number of strokes it took them. All subsequent balls for that player will be plunged.  Scores on each machine will be tabulated. The players are ranked from lowest to highest score, with lowest score being declared winner at the end of the event.  There will be no finals to this event. Rather, standings after qualifying rounds will determine the winner of packages. Players from earlier rounds do not need to be present at the end to earn their prize; they'll be notified via email or text message. Players must show up to at least 15 minutes before their scheduled tee-off time and pay their $10 entry fee, or may lose their reserved tee-off time to someone on the Standby list. Registration closes once all tee-off times are filled. Players can get onto a standby list if available to play and there is a no-show. 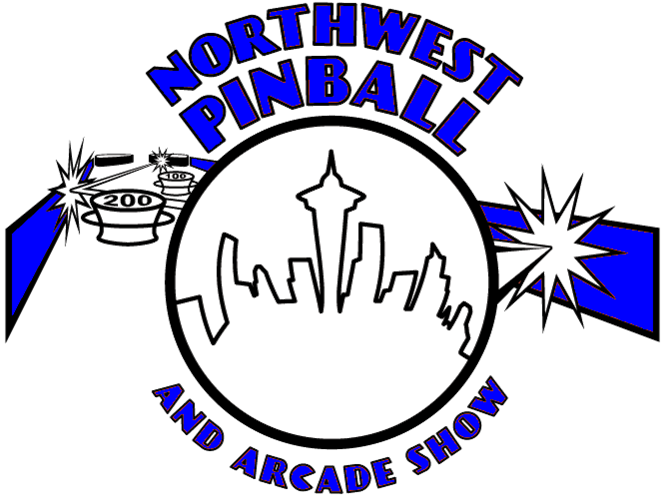 The MNP Team Brawl is a special annual collaboration between Monday Night Pinball and NWPAS, and annually kicks off the NWPAS Satellite Pinball Tournament Series. The tournament is run the old-fashioned way: no computer, no software, with pen and paper, and scores transcribed to a poster board!  A Maximum of eight teams .  Each team must have 10 players. The team will be required to forfeit 3 games during the night for each missing player.  The 10 players do not need to match MNP teams, although we expect several of the teams to compete as a whole, or by merging two teams.  Team restrictions will use IPR, with maximum cap of 40, no exceptions due to grandfathering. Thus a team currently over the cap of 40 is not eligible; one top player will need to drop out or play for a different team.  A maximum of two IPR=6 players on a team.  IPRs that are frozen for first half of MNP season will be used, allowing teams to form well ahead of the actual event date.  Entry fee is $100 per team ($10/player).  Pre-registration is required by a current MNP Team Captain or Co-Captain.  First 8 captains to pay the team entry fee become the managers for the team, and have choice of which players will play on their team.  These 8 captains can also choose to captain the team themselves, or delegate to one of the players on the team.  Payment for the team needs to be paid fully at once; either cash directly to Dave Stewart, or via Pay Pal.  Team Names, Captain's Name, and Rosters are due one week before the MNP Team Brawl. Roster changes after this date are subject to penalties as defined below.  Each round will be against a different team on a pre-selected set of four machines.  There will be four doubles matches in a round, such that 8 of the team's 10 players will play each round.  Scoring is identical to Monday Night Pinball doubles scoring.  After four rounds, the two teams who have earned the most points will compete head to head in one sudden death round, of FIVE doubles games with all 10 players playing, to determine the tournament winner.  3rd and 4th place after the four rounds will play in a Consolation Final Match for additional prizes.  The machines for each round will be determined ahead of time and listed on the schedule; teams get to select which players play on each of those pre-selected machines.  Each round, one team will be designated as 'home', other team as 'visitor', such that the visiting team picks which players play on which machine first, and will play first during the game.  Each team's matches and machines to play will be posted at least four days prior to the event. However, matches or machines are subject to change in unavoidable circumstances (such as machine swap-outs).  Every player on the team must play at least 3 of the four rounds, or the team will be penalized 3 points for each player that doesn't play 3 games.  If exactly two teams tied, and they played each other during one of the rounds, the winner of that round wins the tie.  Most number of points earned in one round.  Second most number of points earned in one round.  Third most number of points earned in one round.  Most number of games won with 5 points.  Most number of games won with 4 points.  Most number of games won with 3 points.  If tied, but for seeding only, flip a coin.  If the tie cannot be broken by the above criteria, a single tie-breaker game will be played. Each team picks three players, each player plays one ball. Randomly chosen machine.  Rosters are due one week before the event. There will be no penalties for roster changes up until this deadline.  A team that fails to submit their roster by the due date will incur 2-points penalty per day late.  No penalty for up to one roster change made between March 12 and 16th.  One penalty match point for each additional roster change made between March 12th and 16th.  Two penalty match points for any roster change made within a day of the brawl (March 17th or on March 18th), regardless of whether or not you've made prior roster changes.  Maximum penalty due to roster issues for a team is 9 points.  Rationale: Team schedule, machines, and rosters will be posted at least four days prior to the event. This allows teams to strategize ahead of time, and have different players practice different machines, in preparation for playing various opponents. Last minute roster changes are surprised to the opponents and can impact such strategy and are thus unfair to opposing teams; thus penalty points are used to encourage establishing a solid roster early, and discourage late changes.  Each of the 10 players on the winning team will win an NWPAS tournament package.  The second place team (loser of the finals match) will win a box of SWAG, a collection of items from various NWPAS and location sponsors.  The third place team (winner of the Consolation Finals), each player on the team will earn a Free Entry into one of the other 2019 NWPAS Satellite Tournaments.  First Tie Breaker: Number of 7-point wins, number of games with 6 points, number of games with 5 points, etc.  A significant tie is one that affects who advances or doesn't, or produces a different prize amount. The second and subsequent tie-breaking depends on whether it is a significant tie or not.  If not a significant tie, then ties for seeding will be broken randomly, ties for final position will be submitted as a tie.  Second Tie Breaker if still tied and it is a significant tie: Player who scored highest in last round. Then previous round(s).  Third Tie Breaker if still tied and it is a significant tie: One ball sudden death on machine randomly selected by tournament director.  When using NWPAS Software with NWPAS scoring, the first tie breaker will be illustrated in the results via a decimal point in a player's total points earned. 0.1 added for each 7-point win. 0.01 for each 6-point win. 0.001 for each 5-point win.  Thus a score of 23.102 means one 7-point win, zero 6-point wins, and two 5-point wins.  When using Matchplay.events software with IFPA scoring, the number of firsts and seconds are displayed in the rightmost column of the standings, to the right of total points earned.  Tied players will play a one-ball tie-breaker on a randomly selected machine from the bank they just finished playing.  A significant tie is one that affects prize money.  Significant ties in knockout tournaments will be broken with ONE FULL GAME among the tied players.  Non-significant ties will be left as a tie in final results. Anytime an abnormal circumstance occurs, a tournament official should be notified. To ensure consistency throughout the tournament, PLAYERS SHOULD NOT RESOLVE ISSUES ON THEIR OWN. Except for customized rules explicitly covered on this website, PAPA/IFPA Tournament Rules will be used to address malfunctions and as the basis for rulings. Note also that any rule posted at the event, such as on the backglass of a machine, will override any rule described herein. The rules listed here are generalized for all NWPAS events, and might not apply to some specific formats. Runaway Score Rule: Pinball is not a timed game, and occasionally a player has a dominating game that could take a half hour to an hour or more. While these can be impressive games to watch, they wreak havoc on a tournament schedule. This Runaway Score rule is to address such long games to ensure sufficient time to play every game within constraints imposed by the schedule. If a player has an extremely strong game in which it is highly unlikely that any opponent catches them, the tournament official may invoke this rule and ask the player to end their ball and game, in favor of saving time. The tournament official may consider factors such as reachability of the score by opponents, prior demonstrated strength of opponents, whether the round is ahead or behind schedule, or other factors that can affect successfully running a full round. Should this occur, the player automatically receives 7 points for the win (or 3 points in multi-play scoring), regardless of the ensuing performance of any other player. During the course of the game, if any other player catches this runaway score, that player will also receive 7 points (or 3 points in multi-play scoring), and be asked to end their ball and game. Points earned by other players who do not exceed this runaway score will be per the position they finish in. If only one player reaches runaway score, then bonus points will be computed normally, except that the player with a runaway score will always win the bonus point. If more than one player reaches a runaway score, then players who finished 3rd or 4th will not receive any bonus points in that game. Delay of Game: Due to the tight show schedule, delays due to players not being ready to play are problematic. When a new game is announced, players are expected to immediately proceed to their assigned machine. If a player has not shown up within one minute, please notify a tournament official, who will start a 2-minute timer. Players who have not arrived within 3 minutes of the start of a round may be given an official warning and have their balls plunged by a tournament official. Between balls, players are generally allowed 30 seconds to get to the machine and start their ball. Exceptions could be granted (e.g. player needed restroom; tournament official is involved in game and needed to make a ruling, technician at neighboring machine needs space, etc. ), but these are generally expected to be occasional and the player would have informed the other competitors ahead of time of the need. No additional time is provided if previous player tilts, due to use of fast-settling tilt bob. If a player regular does this, opponents should notify a tournament official. Upon first observation from a tournament official, a warning and ensuring player is familiar with this rule. Repeated offences within a round may lead to disqualification from the game or round. A tournament official may plunge the ball of a player on first offense if they take more than 2 minutes and haven't informed opponents of the need for extra time. Extra Balls: Extra balls will be disabled whenever possible at the main event, but likely will still be enabled in most satellite tournaments. Any extra ball is to be plunged, unless a note on the backglass says to play it. If an extra ball is to be plunged, then player may touch flipper buttons to setup skill shot, then plunge ball in attempt to get the skill shot. The player may also choose to tilt the machine prior to plunging in lieu of skill shot and end-of-ball bonus, but a tilt anytime after a first plunge attempt will result in disqualification. Once ball is in motion the player must step back and cannot touch the machine, unless the ball returns back to plunger lane and is not auto-plunged, at which time they can re-attempt a skill shot. In the case that a player has a compensation ball awarded due to a major malfunction, and they earn an extra ball, they may choose to play the extra ball in lieu of the compensation ball in a new game. Fast-Settling Tilt Bobs: In the NWPAS show tournaments, machines will be equipped with Fast-Settling Tilt Bobs when possible, using the ear-plug tilt hack, so that even sensitive machines tend to give only one danger warning after a strong nudge or save. With this mechanism, the tilt bob usually settles to a full stop within 15 to 20 seconds, and thus no need to wait longer between players when the prior player ended their ball by tilting. As a result, the delay-of-game rules don't allow for extended waits after a player tilts, as described next. This does not apply to satellite tournaments that are held on location, with most machines as-is. Machine Availability: In case of machine inavailability, the maximum player count listed for a round could be reduced, or a backup machine from the Expo floor may be selected for use in lieu of the broken main bank machine. Prize Pools: The advertised prize pools are subject to reduction in case of major problems that reduce the number of available paid entries in any of the tournaments. This includes but not limited to power failures, natural disasters, weather-related closures, and significant technical issues. Note that each satellite event may have an alternate or additional designated tournament director who may run the tournament and make official rulings. For questions and inquiries regarding tournaments at NWPAS, please contact wapinball@gmail.com. Back to Main Tournament Page.